It’s not uncommon for a popular movie to be the theme for an online slot game. Playtech’s newest release is no exception to that rule. It’s a tried and true formula that has benefited the company for a long time. This is actually their first new online slot game in a while. It is proving to be one of Playtech’s most entertaining games to date. The company’s previous releases have gotten good reviews from the online slot playing public, but some people were wondering why they hadn’t released a new online slot game in a while. Some of Playtech’s earlier releases have been among the most popular selections on the internet when it comes to free online slots at SlotsClub.com. The game revolves around the popular 90’s comedy “Ace Ventura: Pet Detective” starring Jim Carrey, and Courtney Cox. 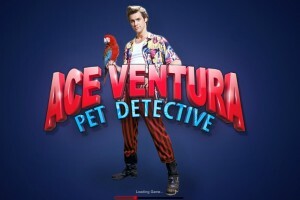 The plot revolved around Ace (played by Jim Carrey) and his pet detective business. He solves animal related crimes in Miami. The movie spurned a litany of catchphrases in popular culture. The most popular is probably “alrighty then”. People still use it today. The game is similar to other online slots. It has a five reel design with three rows. There are 243 different ways to win the game based on different combinations that you find on each reel. 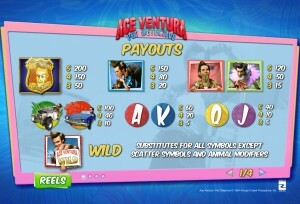 There are many symbols that can be played on the “Ace Ventura” slot game. The most basic symbols are the playing the card symbols. These symbols use the 10 card through Ace card. They are worth the smallest amount of coins on the online slots. 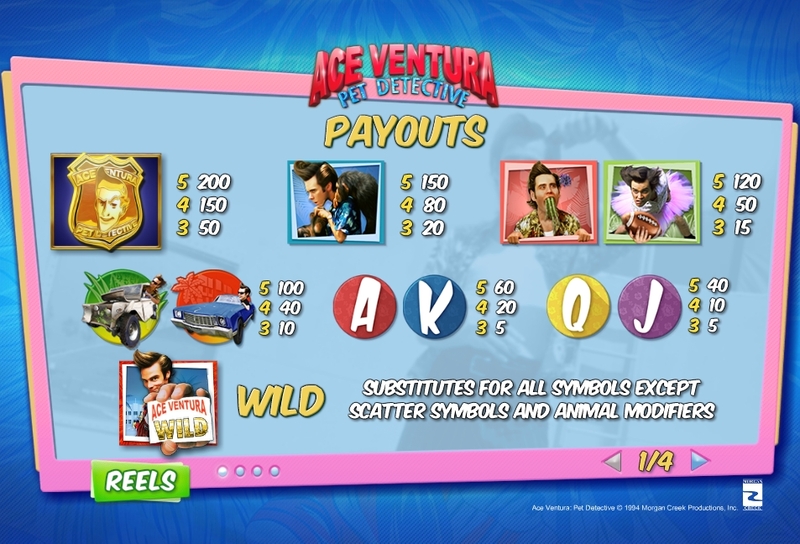 There are also six higher value symbols on Ace Ventura too, one is a Marshall’s badge, and the others in Ace in different vehicles. These symbols are worth a lot more when they hit. Besides those symbols, the other outcomes that a player can have is going “wild”. There are three different ways that a player can go wild on the Ace Ventura slot machine. On two of them, Ace will randomly change different symbols on the screen to wild after a spin. He does this with an accompanying animation that is actually pretty hilarious. On one he does a funny walk and on the other he uses a bevy of his jungle friends to change the symbols randomly. Playtech really hit the mark with their Ace Ventura online slot game. The game play is smooth and sleek and the animations are top notch. It is everything we have to come to expect from Playtech when in comes to game play in online slot machines. 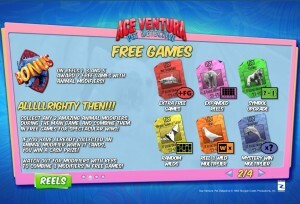 The hilarious theme surrounding the movie “Ace Venture: Pet Detective” makes the game play even more entertaining. There are 5 reels and 3 rows. This gives players 243 different ways to win on the online slot game. This includes the variety of different ways that the game can go wild and give you bonuses and free spins. 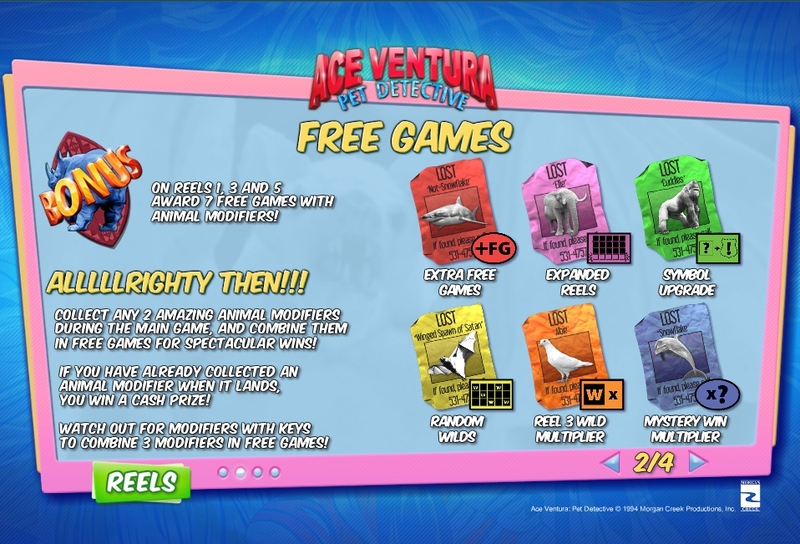 You never know what Ace is going to do next on this new playtech online slot game. If you are looking for a lot of chances to win and great gameplay design that stays entertaining latest movie related release from Playtech may be for you. 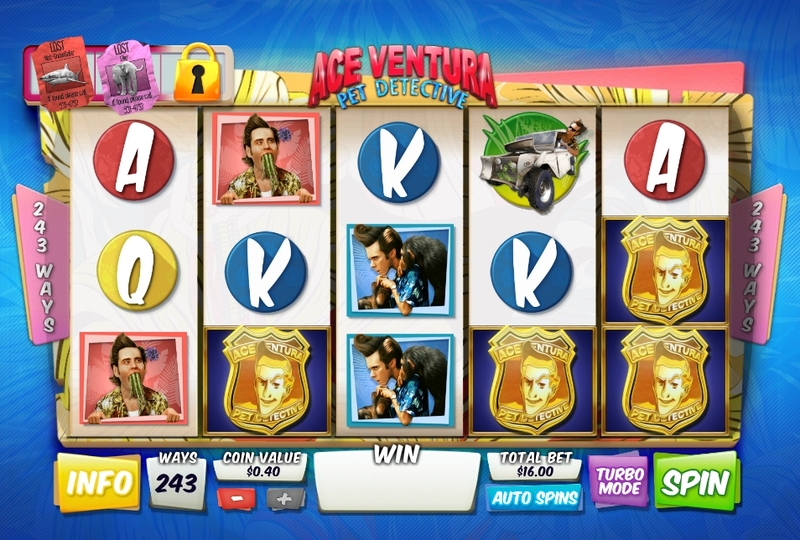 When someone asks if you want to play Ace Ventura online slot game you should say “alright then”.